Learn how the power of kindness can help people overcome their professional and personal challenges. Has your child ever had a pebble in her shoe? Well, that’s what my daughter thought she had too. Last week, I was standing in our dining room, looking out the window, watching her play in the backyard. After a couple of minutes, she stopped, stooped down and untied her shoelaces. She removed the shoe and vigorously shook it upside down. After retying her shoe, she went back to running around. A little time later she paused again and repeated the shoe routine. Unlike her father, my daughter is usually pretty patient, but after stopping for the third time to carefully examine her shoe, I could see she was she was getting frustrated. “I’ve got a pebble stuck in my shoe, but I can’t seem to find it,” she replied. I walked out to the backyard and sat down on the ground next to her. “Let me take a look,” I said. Think about how many times you’ve shown your kids kindness, helping them through the minor and major challenges of life. 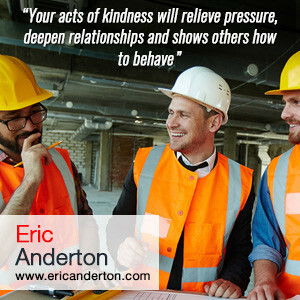 In this article let’s think about the people that you lead in your business, and how you can show them kindness. 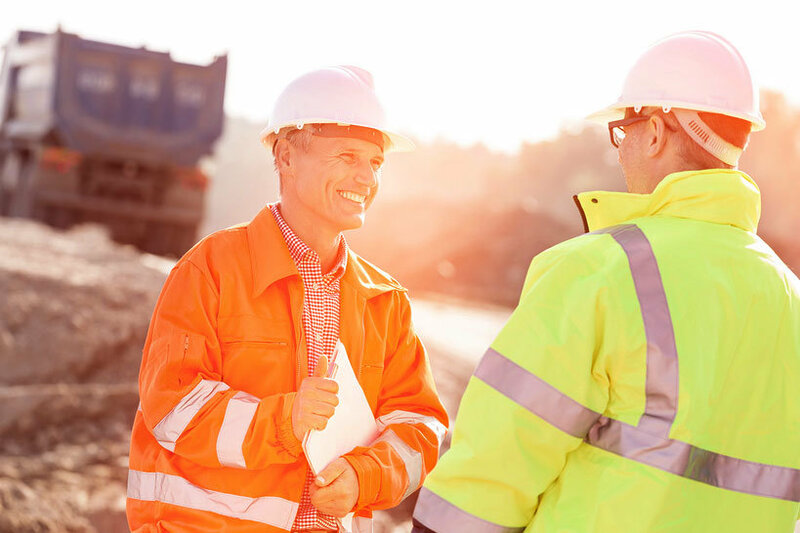 Do you remember the first day you walked on a job site? Whether you were brought up through the trades, fresh out of college with a degree, or just looking for a job to make a little money, you were “green.” Despite your lack of experience, you showed up on time and worked hard. Eventually, a journeyman, foreman or Project Manager noticed, took you under their wing and began to school you. They had been in your shoes and wanted to help you to improve your performance. Construction is a tough, complicated business. Building a profitable project takes a great deal of teamwork and hard work. Mistakes, misunderstandings, and conflict are common. Some people are just starting in their career and need a lot of attention. Others are transitioning into a new position, or perhaps are building a particularly challenging project. You have the experience and insight that can enable them to address their toughest problems. 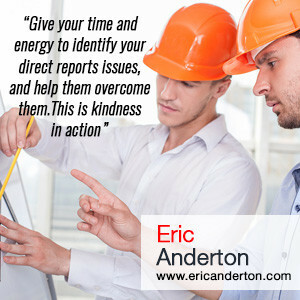 Give your time and energy to identify your direct reports issues, and help them overcome them. This is kindness in action. Help your people through personal issues that impact their work performance. In the early 2000s, I was working for a small company selling copy machines. I worked hard and was very successful. Unfortunately, for about six months my personal life was in turmoil, and it affected my work performance. One day my boss called me in and asked what was going on. I was a bit ashamed, but I told him about my struggles. I thought I was going to get a dressing down, but instead, he gave me his full support and offered to help me through my situation. He overlooked the temporary dip in my productivity because he knew I had done well in the past and was willing to bet that I could succeed again in the future. His act of kindness relieved a great deal of pressure and deepened our relationship. I learned a valuable lesson about how I should treat others. At our worse, we are lazy, weak, selfish and afraid. Some leaders are quick to drop the hammer when someone screws up, others are a bit softer and live in the hope that a person will change over time. The wise leader is patient and available to help but has no illusions about human nature. The opposite of kindness is allowing someone to behave like a knucklehead indefinitely. 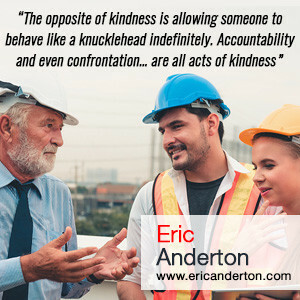 Accountability and even confrontation, if motivated by a desire to help the person improve their performance and grow as a person, are all acts of kindness. Opportunities for kindness are all around you. Ideally, you have no more than 6 or 7 people reporting to you. Some, if not all of them are facing professional or personal challenges. It’s your responsibility to come alongside them and offer them help. Meet with them one-to-one at least once every two weeks to see how they are doing. Show kindness to them, develop your relationship, and model how to treat others.